Following the brutal drama of ‘Mobile Suit Gundam’ and after the even darker ‘Space Runaway Ideon’, Yoshiyuki Tomino turned his creative sights onto something altogether different and that was the surprisingly influential series ‘Combat Mecha Xabungle’. And as his popularity drops to unprecedented lows, polls suggest that the party of his former rival for the presidency, the National Rally party’s Marine Le Pen, has overtaken Macron’s “En Marche” in popularity. And as Le Pen and her fellow pan-European populists organize to mount a credible challenge to the Brussels establishment during the upcoming European Parliamentary elections in May, Le Pen is making a notable pivot in her party’s platform, presumably to try and make it more appealing to more centrist Europeans. According to RT France, Le Pen told the press on Thursday that leaving the euro – once a hallmark of her party’s position – was “no longer a priority” for National Rally. “Unquestionably, the euro is a blow for France” but out “is no longer a priority,” Le Pen said Thursday, advocating a change in monetary governance of the European Union. “If we change the monetary” governance and “we see that it is sufficient to allow the French economy to recover the handicaps that have been created by the currency, we will keep the change. We are pragmatic, we are not ideologues,” said the president of the National Assembly in the margins of her wishes to the press at the headquarters of his party in Nanterre. 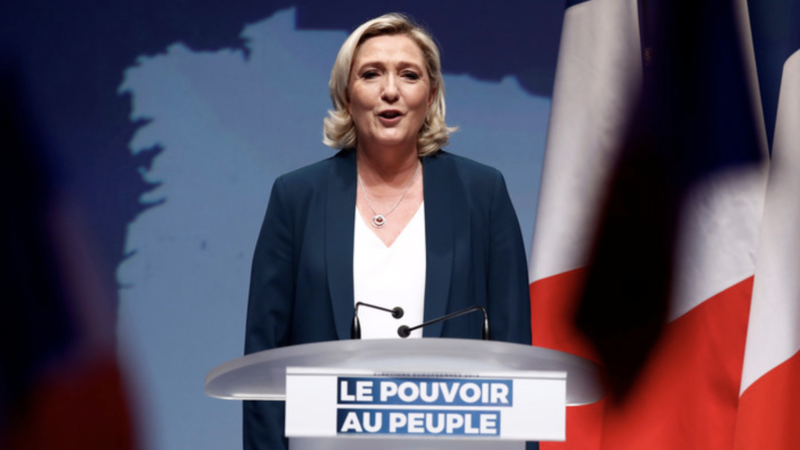 Though opposing the euro will no longer be a priority, Le Pen had some disparaging words for the European Central Bank, a sign that she is pivoting to an economically populist agenda targeting inequality and immigration. Instead of directing its policies to the benefit of European workers, the ECB’s focus on inflation has led it to a monetary stimulus policy that has helped widen inequality. “The governance that has been chosen and which aims for the ECB [European Central Bank] to fight only against inflation and to refuse to fight against unemployment, poses a real problem,” said the finalist of the presidential election in 2017. “Money creation by the EU, instead of being sent to agencies to invest in the real economy or even directly to states…is for banks and is lost, diluted in the virtual economy,” she said. Instead of focusing on leaving the euro, Le Pen would rather RN focus on border sovereignty and economic issues like the French budget, a position that echoes that of Italy’s populist leaders, who recently faced down the EU and won permission to blow out the country’s budget deficit. Fresh off a nearly 80-city world tour with Shania Twain, Swiss singer Bastian Baker talks his greatest moments from around the globe, the past, present, and future of his career, and the role of fate in his life. This Week In XR: All The AR/VR News Fit To Click! In this post we look at some of the innovative ways Royal Dutch Shell is using artificial intelligence to accelerate the digital transformation of the oil and gas giant. This includes the application of machine learning, deep learning, reinforcement, and machine vision. Before UFC bantamweight champ T.J. Dillashaw can face flyweight kingpin Henry Cejudo at UFC on ESPN + 1, he has to beat the scale. The weigh-in for the event takes place on Friday. You can watch a live stream of the ceremonial weigh-in right here.